Yet despite Longfellow's interest in personal motive and dedication, Evangeline is not dominated by the character of either its heroine or any other individual. There is no vibrant quirk of humanity that makes any one of the cast memorable in his or her own right. It is the theme and the setting, rather than the distinctiveness of the lovers, their families and friends, that creates the drama of the poem. The essence of Evangeline is the history of the Acadians, what Longfellow saw as a simple, devout and prosperous people, whose community was unwarrantedly and brutally destroyed by the English. This disaster was accepted by Longfellow's Acadians with stoic calm, Christian fortitude and resignation. By far the greater part of the poem centres upon the fate of the community and it is the last sections alone that turn upon the destiny of Evangeline and Gabriel. After wandering across a continent in search of her own true love, Evangeline meets him on his death-bed, a consolation vouchsafed to her because of charitable works of mercy during the smallpox epidemic which had struck the town in which she was then living. primeval" are the opening words of the epilogue. Here is the poetic art of Wordsworth's rules complete: the recollection of emotion in tranquility. Longfellow has achieved the imposition of order upon human events. The troublings of human grief are now set in Eternity's perspective. But any attempt to account for the success of Evangeline by dissection is very much like seeking the success of a Chopin nocturne in a single bar or phrase; murder indeed will have preceded dissection. The opening words of the poem have, by the very difficulty that they pose to translators, a ring of quality. Yet while the writings of Parkman and other historians were undeniably an important part of the debate, the argument was neither purely academic nor just the question of the historical reputation of Nova Scotia. During these same years people identifying themselves as Acadians had held national conventions at Memramcook, New Brunswick in 1881, at Miscouche, Prince Edward Island in 1884, and at Pointe de l'Eglise, Nova Scotia, in 1890. It is in this context, that of the presence in Canada of a distinct Acadian population, that the debate concerning what happened in 1755 found its greatest impetus. It is also in this context that the argument concerning the historical accuracy of Evangeline should be placed. For however interesting the work is as an epic in hexameters, however intriguing it might be to comment upon Longfellow the romantic historian, the adoption and use of Evangeline by the Acadians as an acceptable embodiment of their own myths remains the most complex and the most crucial issue yet to be fully examined concerning the poem. When the first Acadian newspaper was founded in 1867, Le Moniteur Acadien, its early issues were distributed with a copy of the> French Canadian translation of the poem and.its editorials used the poem as a source of illustrations for messages concerning Acadian unity. The second major Acadian newspaper, which began life as a weekly on 23 November 1887, and which has continued to be a most important expression of Acadian opinion, was baptised Evangeline. Thus the adoption of Evangeline by the Acadians took place at the precise time they themselves were attempting to rally the dispersed and somewhat disparate communities of their kin that then existed in Nova Scotia, Prince Edward Island and New Brunswick. At a time when Acadian self-consciousness, built upon achievements gained in the field of education, was stimulated by the growth of nationalistic sentiment that was characteristic of late 19th century western society, Evangeline became known not only among the Acadians themselves but also among a very much wider audience. There was a fortuitous coincidence between the needs of a struggling minority and the work of a worldrenowned poet. Lefebvre, who became director of St. Joseph's in 1864, may well have been the individual who brought the Acadians and Longfellow's poem together, and it is worth noting that Lefebvre was a man who believed the Acadians to be "un peuple de généraux martyrs", (48) those who had persevered with Christian virtue when other nations had faltered. The poem's emphasis on the holiness of the parish priest and the laudable obedience of Evangeline to clerical authority may have found a sympathetic echo in the religious vision of men like Lefebvre, who encouraged the study of the poem among the Acadians. 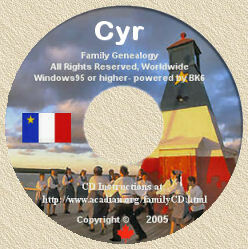 While Hautecoeur has demonstrated the importance of a very simple conception of their past current among the Acadians in the late 19th and early 20th century, a conception which was a most important part of the Acadian sense of identity, it is a conception that is virtually the same as that presented by Longfellow in Evangeline. But it would be unfair to conclude by entering an indictment against Longfellow, who saw the poem as a monument to the fidelity of women and not as an animating myth for 19th century Acadian nationalism. Evangeline as a chosen embodiment of Acadian historical sentiment was never foreseen by its author. (1) Longfellow, undated memorandum quoted in Hawthorne Manning and Dana Longfellow, Origin and Development of Longfellow's "Evangeline" (Portland, Mne., 1947), p. 12. (2) S. Longfellow, Life of Henry Wadsworth Longfellow with extracts from his Journal and Correspondence (Boston, 1891), II, p. 30. (4) C. Welsh, The Works of Henry Wadsworth Longfellow (Cambridge and New York, 1909), V, p. 78. This is the definitive edition of Longfellow's work and the quotations of the poem used in this article are from ibid., pp. 79-178. (6) Quoted in F.A. Landry, "The historical origin of the poem Evangeline", La Société Historique Acadienne, 23ième cahier (1969), p. 114. (7) Welsh, The Works of Longfellow, V, p. 84. (10) This magnificence was the inspiration for the engravings of F. Dicksee that illustrated the French translation made by Louis Duprêt, Evangeline (Paris, 1886). (11) Pamphile Le May, Evangeline, traduction du poème Acadien de Longfellow (Québec, 1865). (12) Suzanne Le Touquin Vinet, Acadie (Belle Isle en Mer, 1970); Maurice Trottier, Poème de Henry Longfellow Lafayette and Manchester, New Hampshire, 1977). (13) Evangeline (Paris, 1886), p. 33. Dicksee's illustration to this line, in this edition, is that of a simple field bordered by forest; the field is overgrown and one can imagine this also as an illustration to Tolkien's Hobbit. (14) Welsh, The Works of Longfellow, V, p. 121. (15) See also J.A. Grant, Through Evangeline's Country (Boston, 1894), and H.R. Casgrain, Un Pèlerinage au pays a"Evangeline (Quebec, 1888). (16) Robert Rogers, Concise Account of North America (London, 1765), p. 22. (17) William Burck, Histoire des colonies européenes dans l'A mérique, en six parties (Paris, n .d.). No copy of the English edition of this work is to be found in the British Museum, the Athenaeum, the Library of Congress or the Bibliothèque Nationale. Commentary on this work by Dr. Andrew Brown, "Papers Relating to the Acadian French", Nova Scotia Historical Society, Collections, II (1879-80), p. 150, provides evidence that the English edition had some circulation. (19) "The authorities I mostly relied on in writing Evangeline were the Abbé Raynal and Mr. Haliburton: the first for the pastoral simple life of the Acadians; the second for the history of their banishment". Quoted in H.E. Scudder, Evangeline (n.d. n.p. ), p. 6. (20) Burck, Histoire des colonies européenes, p. 319. (22) Raynal, Histoire philosophique et pratique, VI, pp. 360-1. (25) Welsh, The Works of Longfellow, V, pp. 96-7. (26) T.C. Haliburton, An Historical and Statistical Account of Nova Scotia (Halifax, 1829), I, pp. 180-1. (27) Welsh, The Works of Longfellow, V, p. 120. (30) Haliburton, An Historical and Statistical Account of Nova Scotia, I, p. 195. (32) Welsh, The Works of Longfellow, p. 117. (35) G. Kurth, Evangeline, conte a"Acadie (Liege, 1883), p. xxxi. (36) B.C. Cuthbertson: "Thomas Beamish Akins: British North America's Pioneer Archivist", Acadiensis, VII (Autumn 1977), p. 96. Given the number of Acadians living then in the province it would perhaps have been more accurate to say anglophone Nova Scotians. Forty years after Parkman one eminent Canadian, the Rev. Dr. H.J. Cody, then chairman of the Board of Governors at the University of Toronto, began a movement for the removal of Evangeline from Canadian schools, as it created "a wrong impression of British justice, chivalry and administration", cited by M.S. Spigelman, "The Acadian Renaissance and the Development of Acadien-Canadien Relations, 1864-1912, 'des frères trop longtemps séparés' ", (Ph.D. thesis, Dalhousie University, 1975), p. 13. (37) Le Moniteur Acadien, 5 mars 1885. (38) Quoted in Martin, L'Evangeline de Longfellow, p. 222. (41) R. Rumilly, Histoire des Acadiens (Montreal, 1955), II, p. 715. Of French parentage, Rumilly was born in Martinique and emigrated to Canada in 1928. (42) Martin, L'Evangeline de Longfellow, p. 218. (43) The 1871 census showed 44,907 Acadians in New Brunswick, 32,833 in Nova Scotia, and 10,012 in Prince Edward Island. (44) L. Thériault, "Les Acadiens vus par les libéraux Québécois (1868)", Les Cahiers de la Société historique acadienne, VI (Septembre 1975), pp. 150-3. (47) Pamphile Le May, trad., Longfellow: Evangeline (Quebec, 1870), Introduction, p. 12. (48) Father Camille Lefebvre to Pascal Poirier, 27 décembre 1872, cited by Spigelman, "The Acadian Renaissance", p. 8. (49) For the ideas in this paragraph I am indebted to Professor Gerald Pocius, Department of Folklore, Memorial University, who has generously allowed me to draw on the commentary he presented when the original version of this article was delivered at the Atlantic Canada Studies Conference in Halifax in 1980. For another folklorist's comments on "évangelinisme", see Antonine Maillet, Rabelais et les traditions populaires en Acadie (Les Presses de l'Université Laval, 1971), pp. 13-14. (50) L'Acadie du discours: pour une sociologie de la culture acadienne (Quebec, 1975), p. 119. (51) Robidoux, Conventions Nationales, pp. 87-91. (52) Hautecoeur, L'Acadie du discours, p. 118. (53) Ibid., p. 68 et seq. Click to View "History of l'Évangeline Newspaper". Click to Hear 'Evangeline' Song. Henry Wadsworth Longfellow's first epic poem, Evangeline: A Tale of Acadie, published in 1847, is a story of loss and devotion set against the deportation of the Acadian people in 1755. The poem elevated Longfellow to be the most famous writer in America and has had a lasting cultural impact, especially in Nova Scotia and Louisiana, where most of the poem is set. On April 5, 1840, Longfellow invited a few friends to dine at his rented rooms in Cambridge, Massachusetts at the Craigie House. Nathaniel Hawthorne brought the Reverend Horace Conolly with him. At dinner, Conolly related a tale he had heard from a French-Canadian woman about an Acadian couple separated on their wedding day by the British expulsion of the French-speaking inhabitants of Nova Scotia. The bride-to-be wandered for years, trying to find her fiancé. Conolly had hoped Hawthorne would take the story and turn it into a novel, but he was not interested. Longfellow, however, was intrigued, and reportedly called the story, "the best illustration of faithfulness and the constancy of woman that I have ever heard of or read." He asked for Hawthorne's blessing to turn it into a poem. Seven years after Longfellow first heard the story, Evangeline was published. During that time, he continued his Harvard professorship and published several books, including volumes of his own poetry, translations, and a novel, Hyperion. He also married Frances (Fanny) Appleton, became the owner of Craigie House when her father gave it to the newlyweds as a wedding gift, and had three children, the third christened two days before the official publication of Evangeline. By 1845 when Longfellow began working on the poem, the fate of the Acadians had largely been forgotten. Longfellow researched the basic history of the expulsion at the Harvard library and the Massachusetts Historical Society. He learned that the French began to settle Acadie, modern-day Nova Scotia, in 1604. For the next 150 years, they cultivated the land, maintained a friendly relationship with the native Micmac Indians, and remained neutral in the ongoing conflicts between the French and the English. By the mid-18th century, there were 12,000 to 18,000 Acadians. In 1755 when these British subjects refused to take up arms against the French, they were exiled from their lands, in what the Acadians call "Le Grand Dérangement." The Acadians were scattered far and wide. Many eventually ended up in Louisiana where they formed the basis of the Cajun culture. According to Longfellow biographer Charles Calhoun, "As was his poetic practice, once Longfellow had briefed himself on the factual background, he used his material with a very free hand. He was a bard, not a historian; what mattered was the basic human truth of his story, not its particulars." Evangeline is a work of fiction; Longfellow devised its heroine and her quest, as well as the scenery that she moves through. The poem even starts on a fictional note: "This was the forest primeval" is a better description of the coast of Maine, where Longfellow grew up, than the low-lying marshlands of Acadia, which he had never visited. Factual or not, Longfellow's Evangeline became a huge success. The poem went through six printings in the first six months after being published, and within ten years had been translated into a dozen languages. The poem has been made into two films, one in 1922 and the second, starring popular silent film actress Dolores Del Rio, in 1929. Generations of American children read, memorized, and recited the poem as part of their schooling. Schools, churches, inns, and many other businesses and social groups were named for the poem's heroine. Other authors capitalized on the success of the poem by writing alternate versions of the story. Louisiana Judge Felix Voorhies published Acadian Reminiscences: The True Story of Evangeline, in 1907. In his telling, the lovers are reunited under an oak tree in the Louisiana town of St. Martinville, but when Evangeline discovers that Gabriel has fallen in love with another woman, she goes mad and dies. This version became very popular in Voorhies' home state, where his novel was often taken as historical fact. Longfellow's Evangeline created a tourist industry in the lands of the Acadians. Visitors are still drawn to sites such as the Longfellow-Evangeline State Historic Site in Louisiana, which interprets the lifestyle of the Acadian settlers. Once there, it is just a short ride to St. Martinville to see the "Evangeline Oak" which features so prominently in Voorhies' version of the story. In Nova Scotia, the Evangeline Trail stretches along the Bay of Fundy coast from Yarmouth to Grand Pré and beyond. Evangeline's most lasting impact has been on Acadians themselves, both in Nova Scotia and in Louisiana. According to Yale historian John Mack Farragher, author of A Great and Noble Scheme: The Tragic Story of the Expulsion of the French Acadians from their American Homeland, "[T]he poem struck a spark igniting a cultural and political renaissance among the small Acadian middle class that began to emerge in the second half of the nineteenth century." The poem became a creation myth, and its heroine's hometown of Grand Pré remains a pilgrimage site. In 2004, to commemorate the four hundredth anniversary of the arrival of the French in North America, a two-week reunion was held there. Thousands of Acadians from around the world gathered to celebrate their shared history. Evangeline was Henry Wadsworth Longfellow's first epic poem. Hiawatha (1855), "Miles Standish" (1858), and Tales of a Wayside Inn (1863-1873) followed, cementing Longfellow's reputation as the preeminent mythmaker of his country's young history. Legend of Evangeline"Our perception of the past is often an illusion, a mirage created as much by the biases of the creators of historical records as by the biases of historians themselves. While historians cannot divest themselves altogether of their personal outlook, molded as it is by environmental factors, they can at least attempt to pierce the veil of subjectivity surrounding their chosen topic." In 1847, Henry Wadsworth Longfellow wrote Evangeline as a tragic but fictional account of two lovers, Evangeline and Gabriel, who were separated on their wedding day during the expulsion of the Acadians from Acadie (present-day Nova Scotia, Canada). In 1755, the English Governor of Canada issued an ultimatum to the Acadians to swear allegiance to the British Crown and forsake their Catholic faith or be exiled. They refused and were forced to leave behind everything and be herded onto ships without any regard to family ties. Upon her arrival in Louisiana, Evangeline learned that Gabriel was in the Attakapas district. She began her journey there, but soon found that Gabriel, in a grief-stricken state, had left the region. It was here that she began a lifelong search for her lost love as she wandered through the American frontier. She eventually gave up her search and joined the Sisters of Mercy in Philadelphia, dedicating her life to the service of others. Years later, she found Gabriel who was on his deathbed and died in her arms. She died soon after. Longfellow apparently heard the story of Evangeline and Gabriel from Rev. Horace Lorenzo Conolly at a dinner party with Longfellow's friend Nathaniel Hawthorne [at the Craigie House, in Cambridge, Massachusetts]. Though Longfellow consulted Thomas C. Haliburton's Historical and Statistical Account of Nova Scotia, he did not want his poem to be a documentation of historical events. One of the first Louisiana writers to re-tell the tale was Sidonie de la Houssaye, who used the story in her 1888 novel, Pouponne et Balthazar, which details the story as a family legend handed down by her grandmother. In this story, Pouponne Theriot is separated from her fiancé Balthazar Landry during the deportation. Through the period of exile and resettlement, she remains faithful to her betrothed while caring for her fiancé's elderly father. Balthazar, who has attained the rank of Captain in the French army, returns with an education and the pair are wed. The best known version of the Evangeline story is Acadian Reminiscences: The True Story of Evangeline, a novelette by Felix Voorhies, a district judge and member of the Louisiana House of Representatives. Voorhies' story, published in 1907, is about Emmeline Labiche and Louis Arceneaux, the "real" Evangeline and Gabriel. According to this version, Emmeline and Louis tried to flee the village of St. Gabriel in old Acadie before the deportation, but they were caught by the British and were separated. Emmeline was sent to Maryland and came to Louisiana with a group of Acadians led down the Tennessee and Mississippi Rivers by Rene LeBlanc, the former patriarch of St. Gabriel. According to Voorhies, Emmeline and Louis met again beneath the oak tree by Bayou Teche in St. Martinville. By that time, he was married to another. Emmeline lost her sanity, withered away and died. Until the 20th century, it was widely accepted that Evangeline and Gabriel were fictional characters. The story increasingly came to be seen as a thinly veiled historical account. In 1988, Carl Brasseaux, assistant director of the Center for Louisiana Studies at the University of Southwestern Louisiana, released a book that put to rest the story of Evangeline without mocking the tradition from which it came. "Longfellow wrote a beautiful poem, but poetry is not history," said Rev. Jean-Marie Jammes, once a pastor at St. Martin de Tours Church in St. Martinville. "She could have existed. There was nobody to write history except the pastor of the church who recorded baptisms, marriages, and funerals." And since history is defined as recorded past events, none of these stories can be authenticated. Even if Evangeline, or Emmeline Labiche, did not exist, there were plenty of women who lived, suffered and died like she did. It is likely that the legend perseveres because of its romantic appeal and its testimonial to the enduring spirit of the Acadian people. Acadian Reminiscences, depicting the True Life of Evangeline, is a story centered about the life of the Acadians whose descendants are now residents of the Teche Country also known as the Land of Evangeline. These people lived a pure and simple life with an unbounded devotion to their religion and with an unshakable faith in their God. Their love for one another is unparalleled in the annals of human history, to which may be attributed their fortitude and perseverance in their travels from Canada, upon being expelled by the British, to their chosen Land on the banks of Bayou Teche. The author, Judge Felix Voorhies, relates the story as it was told to him by his grandmother. The story begins by telling of the native land of these Acadians and of the village of St. Gabriel from which they were driven when the French Province was surrendered to the British. It tells of members of the same families being separated and placed aboard different ships and some never to see each other again. The story tells of their landing in Maryland and after some time, hearing that members of theirs and other families having landed in Louisiana. This news brought encouragement and determination, in face of great dangers, to travel to the beautiful Land of the Teche. The author was best able to present this story as it was handed down to him by word of mouth by his grandmother who adopted Evangeline when orphaned at an early age. The writer repeats the story in a simple narrative manner characteristic of the Acadians. To this day travelers may visit the quaint town of St. Martinsville on the banks of Bayou Teche and pay their respects at the grave shrine of Evangeline and for a few fleeting moments live the life of these early settlers. Because of the demands for this story and in tribute to Judge Felix Voorhies, my grandfather, a man of noble character, staunch patriotism and unerring judgment, I, together with all members of the Voorhies family, dedicate this book.